The Predator opens this weekend, finally, after many delays. It's long been rumored that Arnold Schwarzenegger was only offered a small role in the movie. Now, director Shane Black has confirmed that. He explains why Dutch was being relegated to such limited screen time, and ultimately why Arnie said forget it when it came time to reprising the role. The original script for The Predator had Dutch coming in during the third act to help save the day. It was initially set up that way, but when Arnold got the script, he turned his nose up at it. He wanted more than a glorified cameo. So, he turned it down. The ending had to be rewritten. But there's a little more to the story. Speaking with Digital Spy, Shane Black explained exactly how it all went down. "The studio wanted a fresher movie that featured an evolving cast. They didn't want to hinge the movie on the re-emergence of Schwarzenegger. It would probably be more of a matter of his showing up briefly and just participating at the very end, at the climax of the movie. Understandably, and believe me, I completely get it, he said, 'Look, that's kind of a small part, and I don't really think I want to do that. I'm off to do Terminator with Jim Cameron, basically. Or for Jim Cameron'." This is the fourth Predator movie, not including the two Alien Vs Predator mashup crossover movies, making six in total. With the franchise three decades old at this point, it is kind of crazy that Arnold Schwarzenegger has never returned as Dutch, especially since his character lived. Dutch gets name dropped in both Predator 2 and Predators. But he was a ghost after that 1987 original thriller. Like The Predator, 2010's Predators also had a cool Dutch cameo included in the first drafts of the script. But Schwarzenegger didn't show up for that either. When The Predator was first heading into production, it was believed that Arnold Schwarzenegger was definitely going to show up. And toys were even being planned for this iteration. But as we now know, none of that worked out as planned. And even after changing the ending to fit a Schwarzenegger-less sequel, Shane Black still had to go back and reshoot his ending a second time. It's possible that had Arnie shown up, he could have hit the cutting room floor just like his friend Edward James Olmos, who did shoot his scenes only to see them deleted before final cut was called. The Predator does set itself up for future sequels. And Dutch is still very much alive within the canon of the franchise. So it's entirely possible that Arnold could show up for the next iteration, whatever that may be, Black says this. "If there's another movie, there's no reason why he couldn't be either in it, or the star of it, or whatever someone decides at a future date." The Predator is in theaters starting this Friday, September 14. It's getting wildly mixed reviews from the critics that have already seen it. Some even sound a little wish-washy, calling it a big mess that somehow manages to still be a blast. We'll, we'll just have to wait a few days to find out for ourselves. 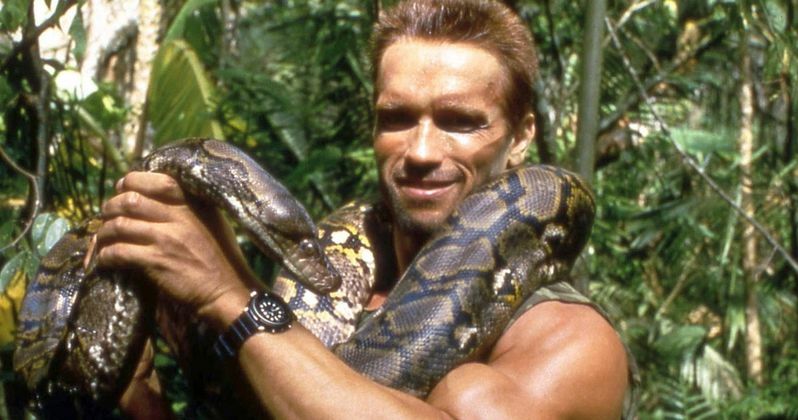 From what we've heard, we're not really sure The Predator would have benefitted from a handful of Schwarzenegger scenes, no matter how fun it would have been to see him fighting the hunter once again.